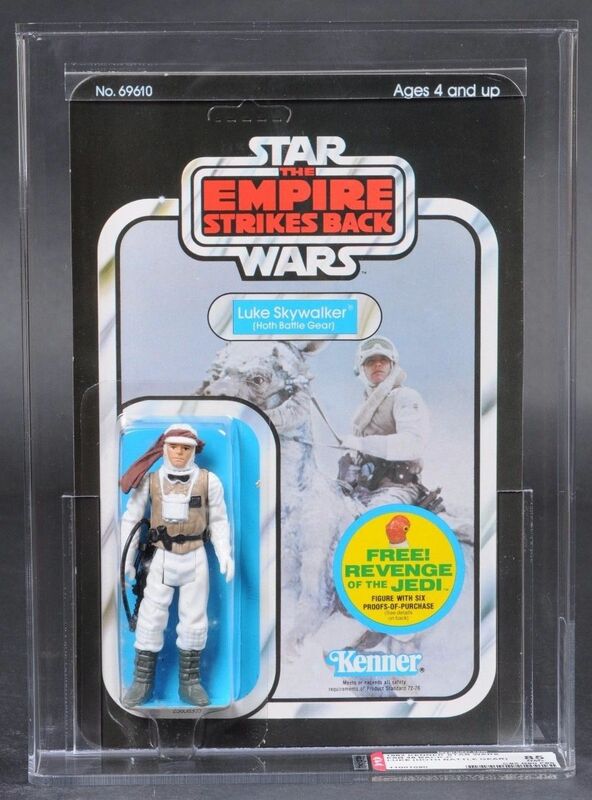 Here's something that's not widely known: When creating several Star Wars action figures, the sculptors at Kenner reused the sculpts for earlier figures, in the process sculpting right over the original art for some of the most recognizable pieces in the line. It's funny to think about, right? As a kid, did you ever imagine that your favorite figures might conceal the remnants -- the very souls! -- of figures that had come before? Had you registered this, you probably would have felt like John Randolph in the movie Seconds when he realizes that the mysterious man who keeps bothering him is actually a long-lost friend -- in someone else's body. 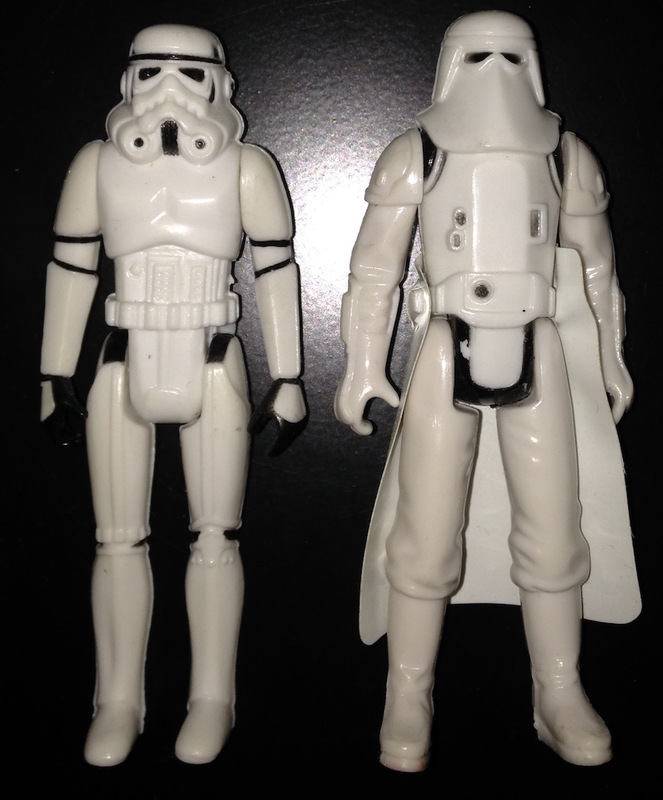 One figure whose original sculpt was refashioned in such a way is the Stormtrooper. 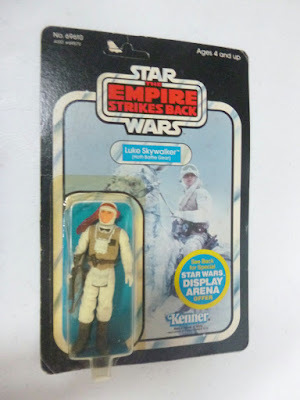 In the late '70s, during pre-production on the Empire Strikes Back line, the original wax sculpt for the Stormtrooper was pulled out of storage and remade into the Hoth Stormtrooper, one of the first figures released in conjunction with Empire. I know what you're thinking: "Those figures don't even look all that similar!" Well, they look similar enough. More importantly, they have the same stature and pose. They have the same construction, too, the heads of both figures being immobile extensions of their torsos. Wax, remember, is a malleable medium, and the folks who work in it employ a combination of carving and modelling. That is, they both cut into the hardened material and add to it through a process of melting and joining. Also remember: Outward looks aren't the only things to consider when creating an action figure sculpt. What's inside matters, too. I know this maxim isn't equally applicable to all situations. When dating, for instance, you always want to seek out the person with the best external appearance, and disregard all of that tedious internal stuff. But where prototypes toys are concerned, you can't afford to be so shallow. As a collector, you're doing yourself a real disservice if you fail to look beneath the skin. A wax action figure sculpt isn't just a solid chunk of pinkish stuff; its torso encompasses a brass "buck," it has nylon or brass disks embedded at the articulation points, and its thinner portions are sometimes bolstered by a wire armature. All of this helps to keep it together, stable, and in proper alignment. But incorporating all of that junk into the wax is a time-consuming and labor-intensive process. By sculpting over a piece that already has it in place, a sculptor can save himself a lot of effort. 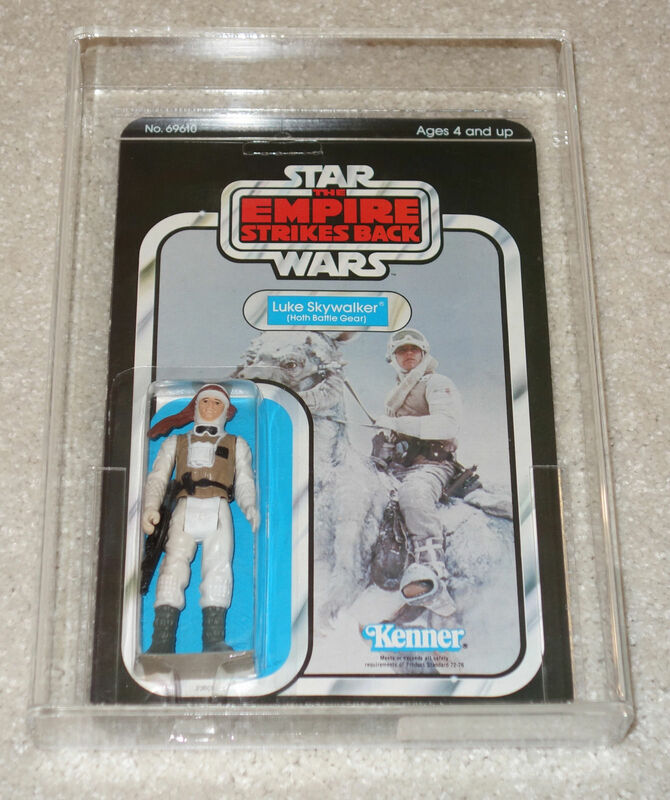 After all, the folks at Kenner weren't in the business of preserving future collectibles; they were trying to bring toys to market. And if a few sculpts were lost in the process, then so be it. The future passions of a few nerdlingers were not dreamt of in their philosophies. What are some other figures that were created over pre-existing sculpts? Any idea which figure served as the basis for Bossk? 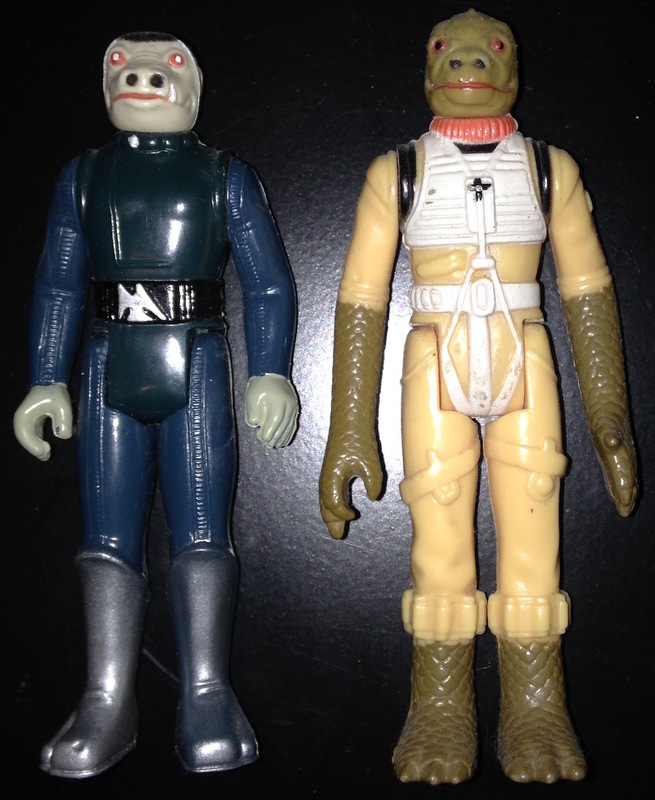 That's right: Bossk is a made-over Blue Snaggletooth. I won't enumerate all the ways in which the two figures resemble each other. It's better if you compare them side by side. Pay particular attention to the snouts, the collars, and the bends in the arms. 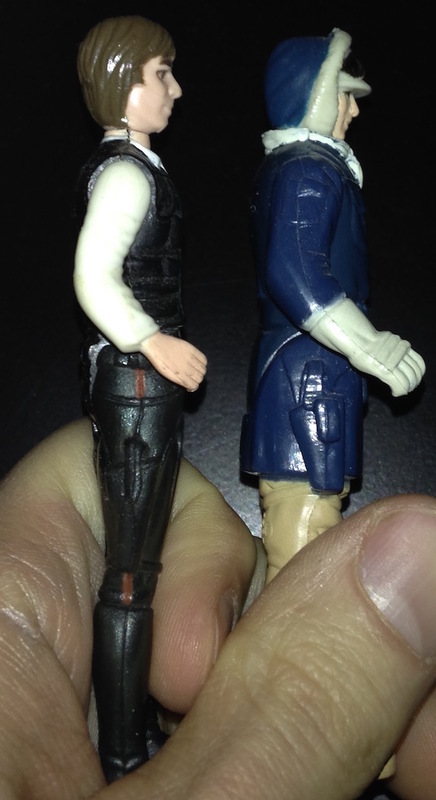 It's likely that other early figures were sculpted into new figures, just as Stormtrooper and Blue Snaggletooth were. But as there is, as far as I know, no solid documentation of this, the identities of these figures must remain speculative. 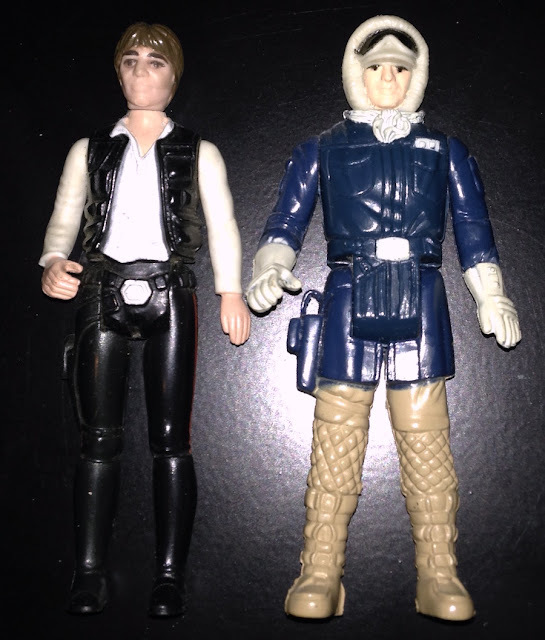 Before closing out this post, I'll indulge in one bit of speculation: I think it's feasible that the sculpt for the 1978 Han Solo was reworked into the 1980 Han Hoth. Pull out loose examples of each figure, and compare them closely. Note in particular the face of the large-head version of the figure, and the way in which it resembles the face of Han Hoth. Now turn the figures on their sides and compare the arms -- the right arms in particular. If you want to extend this comparison to the left arms, you'll quickly notice that they, too, are very similar. Specifically, they both feature the same, very distinctive gesture, with the elbows being fairly straight, and the back of the hands turned outward, with all fingers extended. Pretty suggestive, right? Of course, this doesn't necessarily mean anything. But it doesn't necessarily mean nothing either. What other early sculpts do you think may have been reworked into later figures? 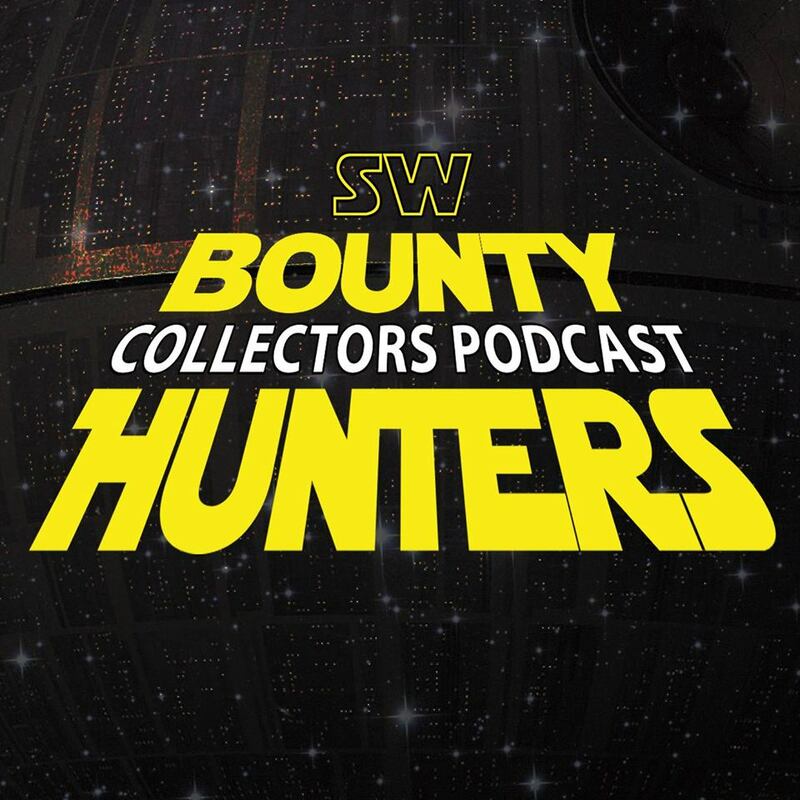 Where do people get information about Vintage Star Wars collectibles? Before Facebook groups and podcasts there were message boards. 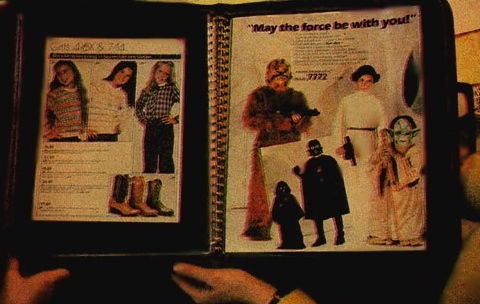 Before message boards there was the Star Wars Collectors Archive. And before the Star Wars Collectors Archive, there was Stephen J. Sansweet’s 1992 book: Star Wars: From Concept to Screen to Collectible. It is the foundational document of our hobby and the book that created the vintage collector mindset. It introduced terms like Hardcopy and First Shot and showed the first photographic display of a pre-production "run" on legendary page 93. It was the first book to talk about both the creation and the collecting of Star Wars memorabilia from Gamorrean Guard banks to Darth Vader wax sculpts. This is the book that started it all, and Ron Salvatore helps us to interview the author on 70th issue of the SWCA Podcast. 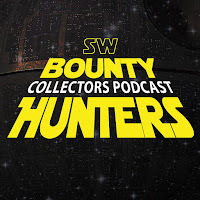 Then, we get a dose of vitamin G with Chris Georgoulias who discusses a few hot topics of the day: the mr.klimko sales, the resurgence of Blue Harvest, and the Mailer Sample Rocket-firing Boba Fett. Come celebrate the beginning of the 7th year of 'Chive Casting! 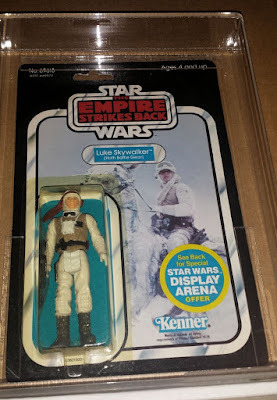 Guest blogger and fellow vintage collector Stephen Ward recently interviewed former Kenner photographer Kim Simmons about his involvement and processes that yielded so many familiar images depicting the vintage Star Wars line. 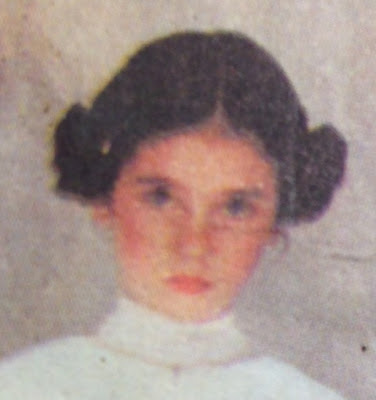 For those of us involved in the vintage Star Wars collecting hobby, the name Kim Simmons is synonymous with the photography used on the cardbacks and boxes of the Kenner products. Kim has been interviewed more than a few times in regard to his work on the line, but I wanted this one to be different. 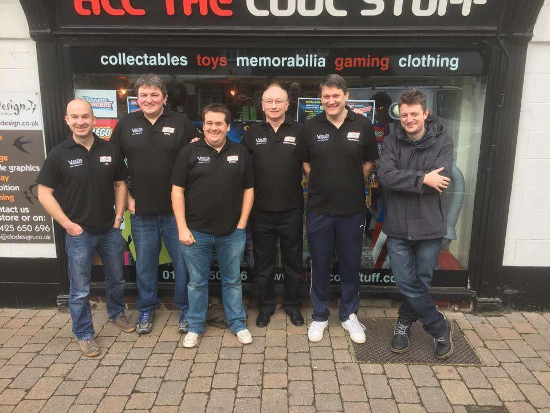 One which covered slightly different ground, and one which delved into the nuances of the hobby that collectors, especially, might find interesting. 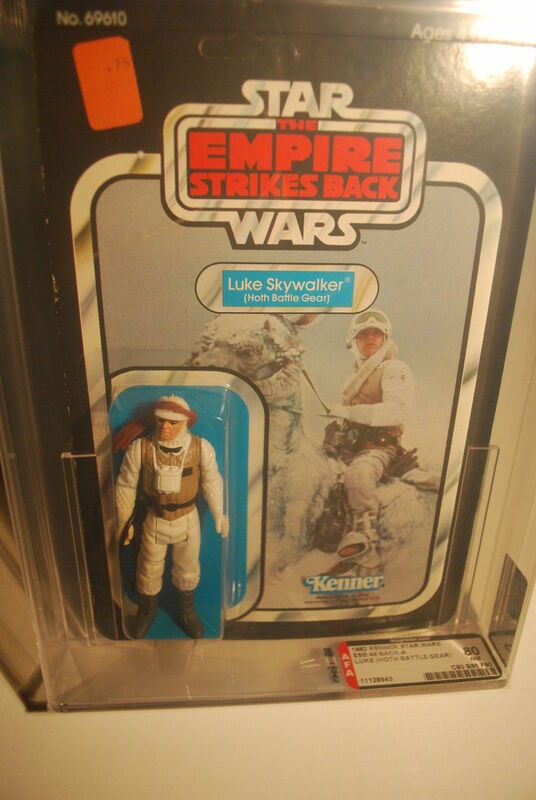 Hardcopies, proofs, Kenner baggies, cardbacks, and the collecting hobby itself isn't usually the material of interviews related to his work, but I wanted to cover that here. We talked not just about the photography itself and the legacy that Kim has, but about the process of actually getting the toys themselves from Kenner. We spoke about what Kim thought about the toy line, his favorite Kenner Star Wars products, and more. Today, Kim runs themanwhoshotlukeskywalker.com, where many of the images he shot are available as archival quality prints. One note that I will add is that Kim is very adamant about ensuring that people know about and remember the late Roy Frankenfield, who is mentioned below in the interview. Roy was the photographer who was working on the line before Kim got involved prior to The Empire Strikes Back’s release. 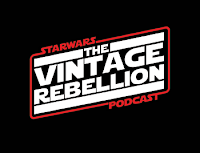 Without further adieu, my conversation with Mr. Kim Simmons about all things vintage Kenner Star Wars. Stephen Ward: When you first began work to photograph the line, did you consider it as something which would be a collectible decades down the road? Kim Simmons: At the time, I can tell you no one ever thought the Star Wars toys would be collectible. 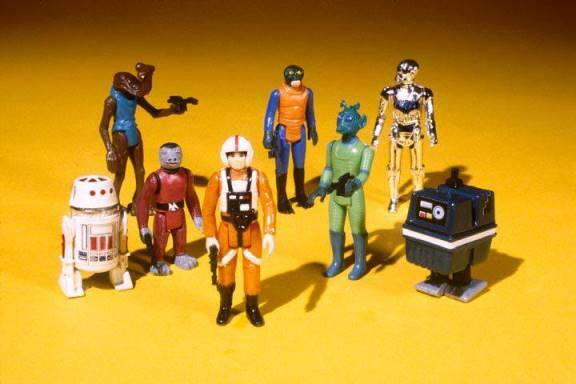 Even today, when I talk with the former Kenner people like I did at the Kenner symposium, they were all saying the same thing: “Who would have thought these toys would be so collectible?" SW: In regard to the toys you photographed (of which there were many), how did the process of you getting them in your hands occur? 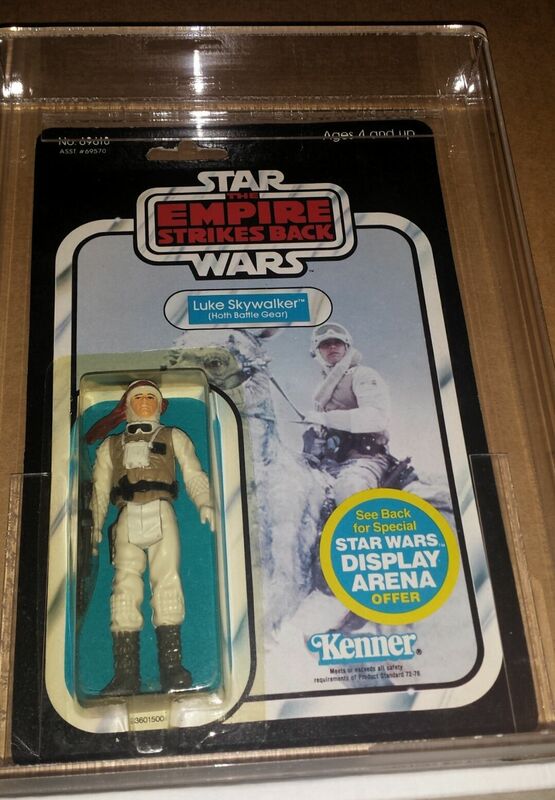 And were there instructions from Kenner in regard to how they wanted the finished product? Was it all related to the “playability” of the products? KS: When I first started, Roy [Frankenfield] was going to the design studio, now LPK, and getting the brief, then he’d come back and tell me what was [discussed], then I ‘d shoot it. Eventually, I would go over, get the brief and come back, shoot it, and take it back. There were multiple steps. If it was a new toy, I’d pick up the toy and shoot it in multiple angles and closeups. At first, I shot them as Roy had wanted, using 35mm, but I eventually shot the initial shots using a 4x5 and the lens I would eventually use, because the designer would select the views (images) which best fit the package within the design. 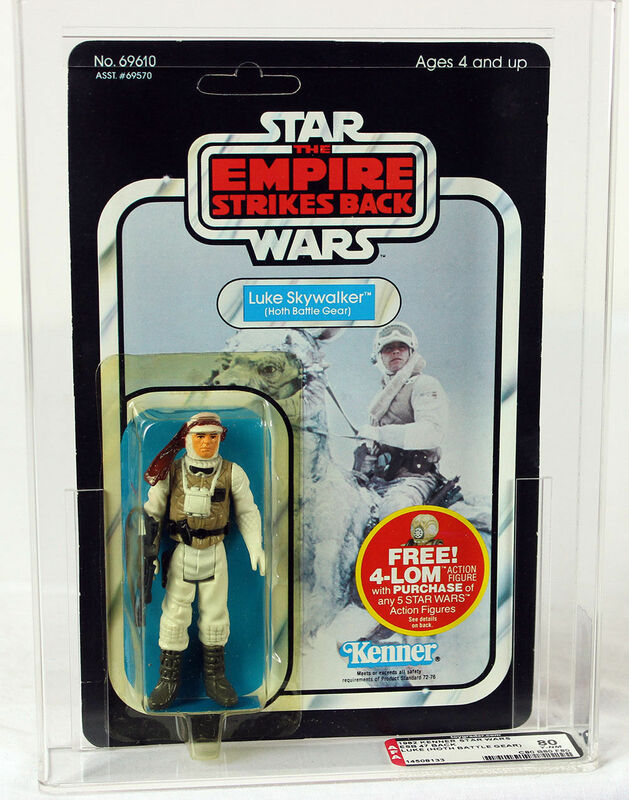 During this stage, there was never a direct contact with Kenner, unless you were to count the sample department. If the figure or playset came to me nicked, I needed to get it repaired, so I would take it up [to the sample department] to get retouched. Eventually, I asked if I could have paint and I’d retouch the toys myself to save time. The idea was to show the playability of the toy by showing the specifics of what the toy was capable of doing -- how to play with the toy. If a child did not know a toy could do something, how would they know how to play with it? We needed to get that across with images. SW: Did Kenner ever solicit feedback about the toys themselves from you, unrelated to your photography work? KS: No, never heard a thing, nor ever asked anything about the toys. Their testing was done before or after a toy was in my hands. SW: Was there anything related to the design of the toys you found surprising insofar as prototypes you photographed vs. the final product? For example, the burgundy cape Bib Fortuna vs. the production Bib Fortuna. Did you ever have any thoughts on why the changes were made, or did you just assume it was a part of the process related to authenticity? KS: I always thought it was so funny to have three different variations of Bib. I learned after Luke’s hair color being changed you just never asked those kinds of questions. It was a change someone wanted done, and it was directed by someone “upstairs” well beyond my pay grade. SW: Having your hands on different iterations of the final figures, did you notice at the time (or afterwards) that the figures and playsets you photographed differed from the ones that ended up on the shelves? KS: To me it was always kind of odd to keep being given the same figure but with tan hair instead of blond (Luke), but that was all I ever thought about. I really never studied the toy shelves once released. SW: As far as process is concerned, the work you did for Kenner, was it a piece by piece rate with them issuing purchase orders to photograph individual pieces? KS: Each toy or figure was its own purchase order issued by the design studio. 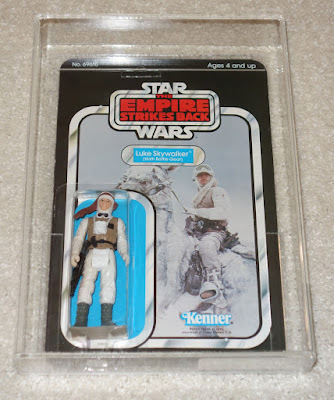 We did do work directly for Kenner, and some of that was Star Wars related, some was not. Usually they had us invoice the design studio. many times those types of jobs were sales presentation-related. SW: How did the pieces that arrived come packaged? 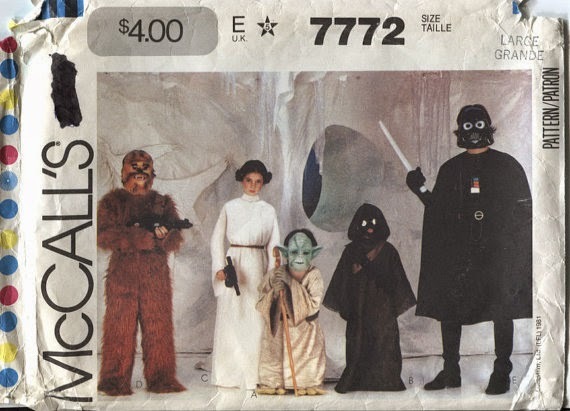 Did you get Kenner baggies with figures in them with their weapon, along with paperwork (manifest of everything in the box, etc.)? Was it a box with random stuff tossed in it? As far as vehicles, especially before production (since there wasn't a box to put it in), how did those arrive? Were there any instructions as far as assembly? KS: Usually new figures arrived in an envelope. Production figures would arrive in a sealed bag sometimes; other times they would come in on a blister card. Playsets arrived in a cardboard box of any kind. Sometimes we’d walk in with the toy itself in our bag, and we’d carry it back and forth. KS: Yes, I knew we were being given hardcopies or first shots, once those terms were explained to me. Those are what I ended up retouching myself. SW: Did anything ever get broken while trying to photograph it? 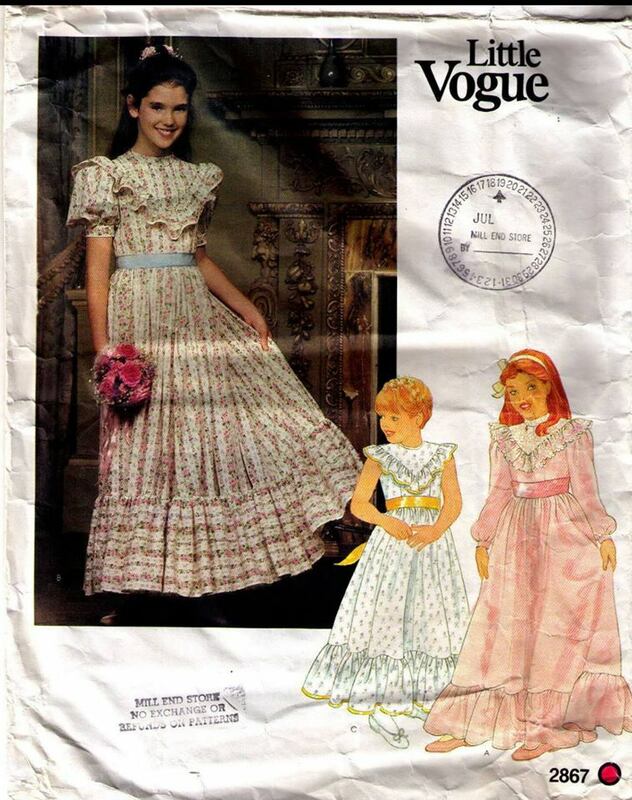 Anything you wondered about as far as how stout the piece would be in the hands of kids once it was released? 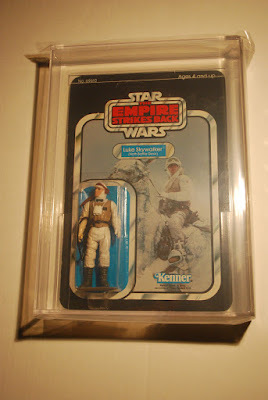 SW: Related to actually receiving products for photography, did Kenner ever send multiples of things to photograph for reasons other than if they were to be in a “diorama” setting (AT-AT on Endor, or the Ewok Village, etc.)? KS: Yes, they did. 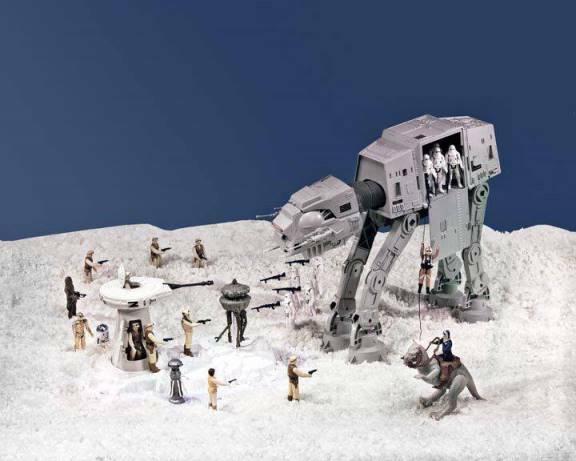 When I was going to be shooting the Hoth Battle scene, I was sent 4 AT-AT’s, multiple X-Wings and Snowspeeders, then I asked for multiple Micro Collection X-Wings and Snowspeeders…and of course a Micro AT-ST for way in the back. I had the [3.75” scale] AT-ST to use in the front. But in many cases, if they had a new toy there might be only one, so I had to deal with the one and rely on Billy to merge the two together. The ISP-6 is one example. I needed two, but only one was available as a photo sample. While rare, when I needed multiples of the same figure, I would be given production figures on blister cards. I never received proof cards with figures I was to use in a shoot unless they were the reason to get them, like to shoot the card with the figure on it. 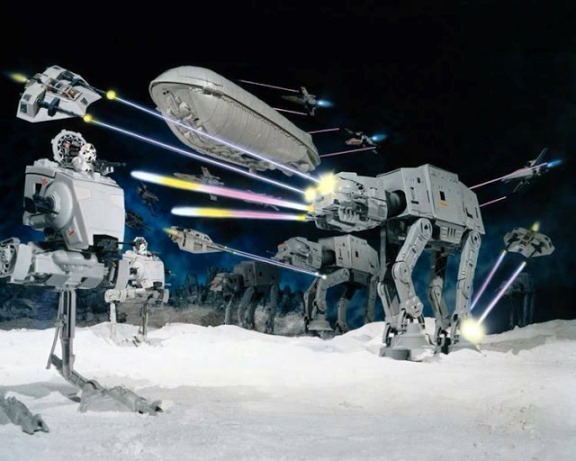 SW: Were there ever any big disagreements with Kenner related to how you set up the shots for box artwork? Did they give you specific direction related to composition and lighting or did they just allow you free reign? KS: Not really, because of the way it was worked out prior to them actually seeing the finished work. By shooting so many different angles of a playset from above, to below, to 3/4 views, then the designer selecting the ones they wanted, they would work out the package using actual photography (in B&W) before any final work. Problems would be worked out during this stage. This was the reason I found it so smart to shoot this stage using a 4x5, since that is how it would be shot eventually. This kept the perspective correct, and no unexpected issues popped up. 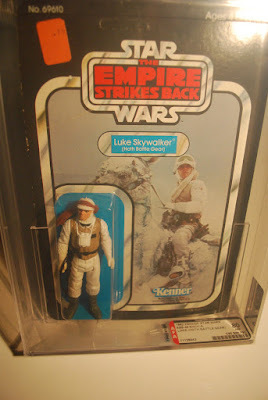 SW: Did Kenner ever send proof cards/box flats your way to show you the almost-finished work before it was on shelves? 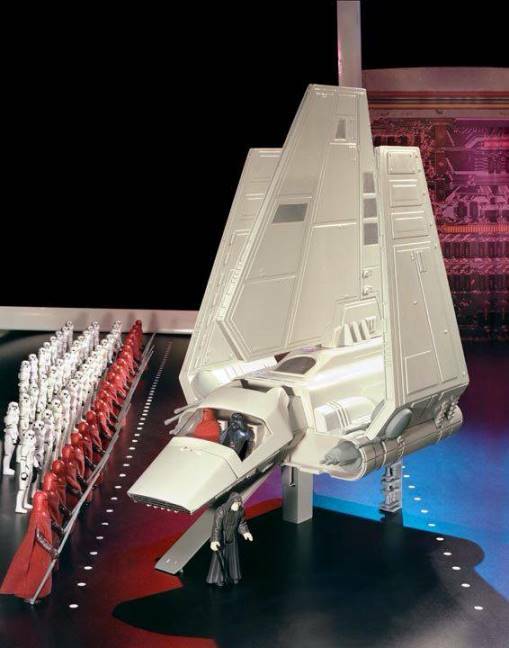 KS: Not Kenner, but the design studio would send us the finished comp to copy; I never saw the flats as I recall. I know Roy did shoot some of the flats in the beginning, but I did not see them until they were shipping, if I saw them at all. SW: What was your biggest surprise related to the line? 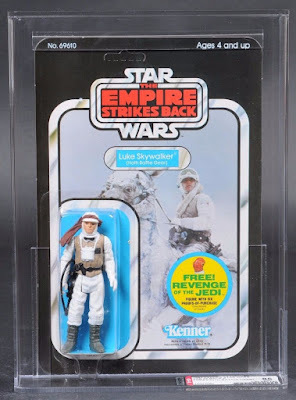 Whether its success, oddities in the line, etc., what surprised you the most about the Kenner Star Wars line overall, or specifically related to a certain piece? KS: Overall, it was the cancellation of the Micro Collection, I thought that line was fantastic (I still think that). SW: Did you have a favorite piece in the Kenner line, and if so, why? KS: Not really, I liked them all, but as I said I really liked the Micro Collection line the best. KS: To me, the Imperial Dignitary was just another figure, the name said it all; he needed no weapon, the Dignitary’s weapon was [his] mouth. SW: Were there any characters you wish Kenner had made for the toy line? Either as just a neat addition, or because you thought it would be interesting/fun to photograph? 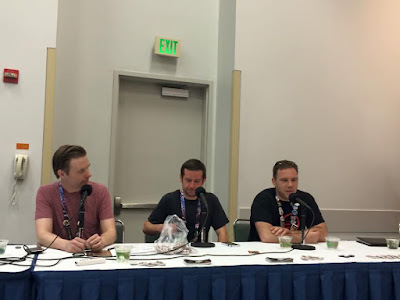 KS: Not really, however I wished there had been Star Destroyers in the vintage line, and a toy Death Star, that could have been very cool, done properly. SW: Did you ever buy figures off the shelves yourself? Either for the fun of seeing your work or for any kind of collecting itself? Did Kenner ever provide completed production pieces for you once photography was done and the figures were on the shelves? KS: Nope, never collected figures, and never bought any for my son, either. But, I would bring home figures for him if he asked for any. I was able to keep, in most cases, everything they gave me to shoot. The Ewok Village was one example of something I was not left with. Eventually, I started asking for production flats, and every now and then they would give me one. SW: Worst Kenner Star Wars toy? Why? KS: Not so much worst, but I originally had issues with the toys that I never saw in the movie. Once it was explained to me that these were being done to expand the playability to larger toys, I just accepted them. SW: Did you ever go into stores and see your photography on finished boxes/cardbacks and have any thoughts related to that? KS: You might find it kind of funny, but no, I never really ran out and checked on the packages at the toy stores. SW: Let's talk legacy. 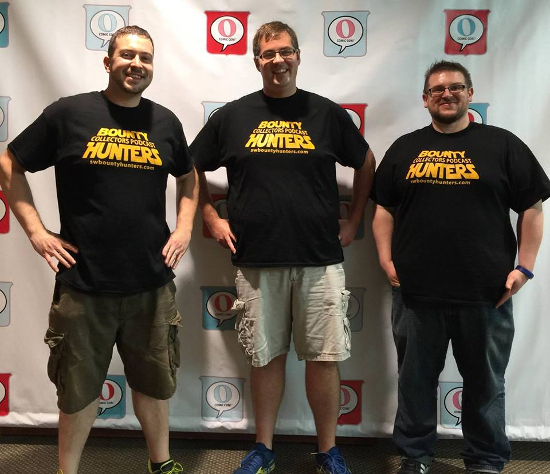 At the end of the day, what do you want your legacy related to the hobby to be? And are you surprised by the fact that you're somewhat of a legend within the collecting community because of your involvement with the line? KS: I was an extremely lucky person to have landed such a job. Yes, I am somewhat surprised at being a legend, but then I know a lot of that is Roy’s doing because he was there first...and it was those first few years that established the legacy. I was just able to continue under him and after him. First off, I’d like people to understand it was a job, it just happened to be a job most would want now not realizing what you’d have to do to land the job. Roy was on the verge of losing the line, very close to it from what I was told. So if anything, I was able to help keep Roy from losing it and eventually purchase the studio from him and continue in 2000 when Kenner/Hasbro left Cincinnati. Overall, I am somewhat uncomfortable being a legend, but it is an ego booster and extremely appreciated. It is because of that I have tried to keep the prints we sell as inexpensive as we can. We sell 8x10’s or 11x14’s for the same amount of money as we charged in 1981 through 2000. The technology changed and that alone allows us to do that. But to do that requires a lot of time and equipment that we were able to accumulate over the years. I’d like people to understand and realize what goes into preparing each image for printing before complaining about the cost of a print. We do this for the collectors out there. Yes, we are able to make a little money, but trust me, it is not very much when you think about the time spent on each image, not even counting the scanning of each piece of film. We enjoy bringing joy to the little kids in each of the collectors. SW: …and the million-dollar question. What do you think happened to the kit-bashed Boba Fett figure? KS: I am betting it was ground up or tossed in the trash a very long time ago.